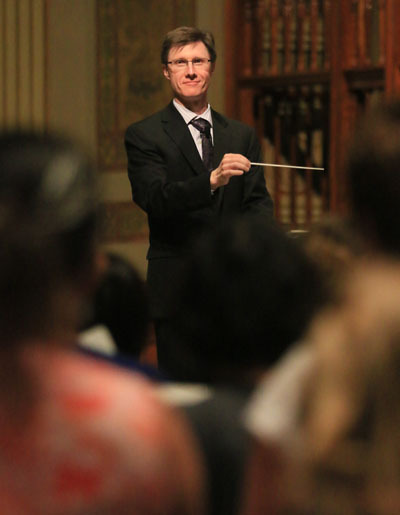 Local parishioner will conduct choirs for papal Masses in Phila. David Kimock has been in the presence of popes. Pope John Paul II touched his hand and blessed a cross he was wearing during a papal audience in 1987. He saw now St. John Paul again in 2003. And during a visit to the Vatican in 2013, Kimock saw Pope Francis. That will make the visit by Pope Francis to Philadelphia next week no less awesome for Kimock because he will direct the archdiocesan choir during the Mass for the people of the Archdiocese of Philadelphia, celebrated by the pope, at 10:30 a.m. Saturday, Sept. 26 at the Cathedral Basilica of SS. Peter and Paul. Kimock admits to a touch of nervousness as he prepares 100 singers to accompany the liturgy at which the pope will preside. But mostly he feels honored to be chosen for the job. Father Dennis Gill, rector of the cathedral and director of the archdiocesan Office for Divine Worship, called Kimock in May to ask if he would be willing to direct the choir for the papal visit. The 42-year-old Kimock, a Byzantine Catholic, is a married father of two and currently the music director for St. Andrew Parish in Newtown. He twice led St. Andrew’s choir to the Vatican, first in 2003 to sing for Pope John Paul during a papal audience. Ten years later the group was invited to sing with the Capella Guilia, the choir that sings at all solemn ceremonies at St. Peter’s Basilica. The occasion was the 500th anniversary of the Capella Giulia and St. Andrew’s was only one of 18 choirs from around the world to receive such an invitation. Being around popes never gets old, Kimock said. “You feel overwhelmed, lifted out of yourself,” he said. “The first time I met Pope John Paul II and he shook my hand, it was wonderful. I found myself shaking and I knew it would be something I’d never forget. I’ll have a similar feeling this time, being in the presence of this great person,” he said. Msgr. Michael Picard, pastor of St. Andrew Parish, said Kimock’s selection is a source of pride and excitement for his parish. “He’s got excellent credentials, with his background in all kinds of music, both voice and all kinds of instruments. He is multi-skilled musically in performance and conducting,” Msgr. Picard said. Kimock coordinates the parish’s adult and children’s choirs, the bell chimes ensemble and school children’s choirs, each of which has individual directors. 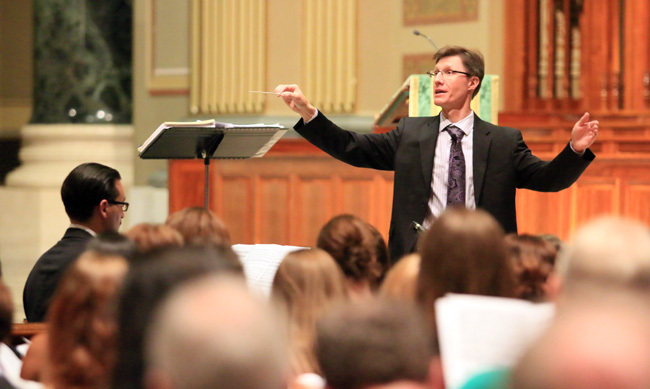 He brings both dedication and devotion to the parish’s liturgical music, said Msgr. Picard. Rehearsals for the papal Mass started in July after a month-long audition process that involved hopefuls from 140 parishes around the Philadelphia archdiocese. Singers from the dioceses of Camden, Trenton, Wilmington and Allentown are part of the choir. A traditional Gregorian chant setting, “Missa de Angelis,” has been chosen for the musical parts of the Mass and will be sung by the choir in Latin. Kimock’s spirits are buoyed by duties beyond the papal Mass. The archdiocesan choir sang at the opening Mass of the World Meeting of Families on Sunday, Sept 20, and will be part of the 500-member choir that will sing at the papal Mass on Sunday, Sept. 27 at 4 p.m. on the Benjamin Franklin Parkway. That choir will reflect the diversity of the church in Philadelphia and include the archdiocesan choir, a Vietnamese choir, the Black Catholic Community Chorus, the Archdiocesan Children’s Choir and the All Catholic High School Choir, all accompanied by the Philadelphia Orchestra and directed by Kimock. When he takes to the world stage to lead combined solemn and joyful music, Kimock with not be alone because another St. Andrew parishioner was chosen as organist for the papal Mass. Sandor Kdar is a native of Serbia who was recruited by Kimock, Msgr. Picard said. “Sandor is an extremely talented musician who brings much beauty to our liturgy. The two of them are an exceptional combination,” Msgr. Picard said.